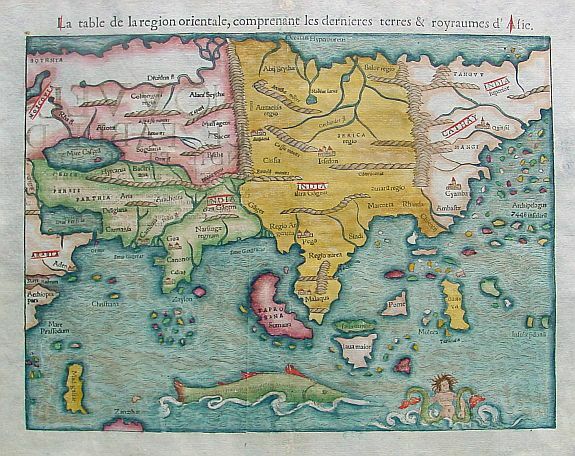 90 M�NSTER, S. La table de la r�gion orientale� B�le, 1568. Beau col. Bois grav�. Infimes rousseurs. - Wood block print in attractive colours. 270 x 342 mm. 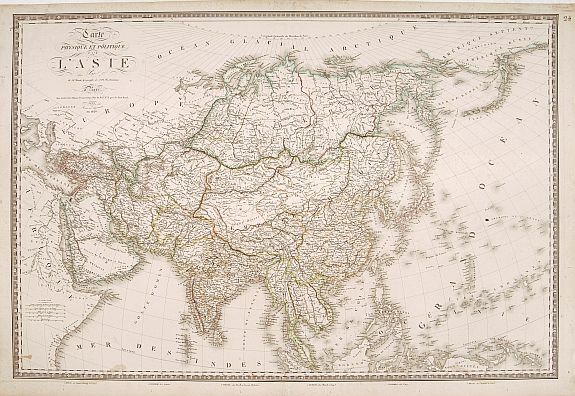 � L'une des premi�res cartes europ�ennes de l'Asie. 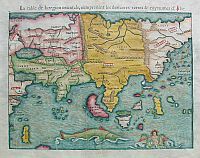 - Although quite crude, M�nster's map does significantly improve upon the Ptolemaic model for the area. The Philippines are part of the scattered 7448 islands mentioned by Marco Polo that are noted on the map. One of the earliest maps of the whole continent. India appears as a peninsula and Sri Lanka, called Zalon, is correctly located. Cambay, Goa and Cannonore are all shown, reflecting the Portuguese presence on India�s west coast. 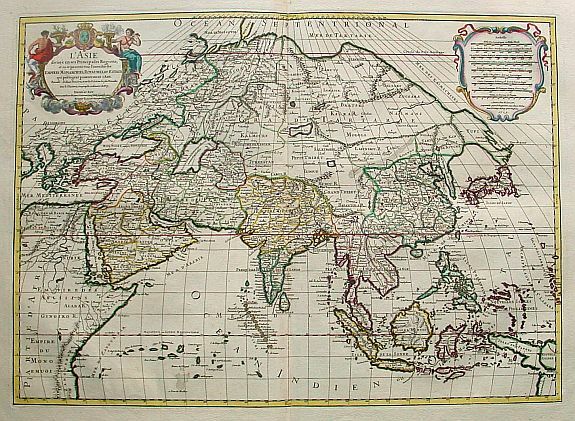 Malacca is correctly located on the Malay Peninsula and the Indonesian island of Sumatra has inherited the name Taprobana from Sri Lanka, but also bears the name Sumatra. Java appears as two islands, Java Maior and Java Minor. The famed Spice Islands of Moluccas are located, but oddly shaped. The coastline of China is fairly accurate but Korea and Japan are absent. Northern Asia is named India Superior with the eastern most part left off the map. Strikingly embellished with a beguiling mermaid and a large, whale-like sea creature. 92 SANSON, N./ JAILLOT, H. L'Asie divis�e en ses principales r�gions� Paris, 1719. Limites en col. ancien. Bel exemplaire. Cartouche col. 457 x 638 mm. 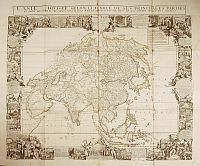 � This fine map is based on Nicolas Sanson Sr's map of 1650, but Jaillot has updated the north-eastern coastline in the manner of Duval's map of ca. 1670. The island of Hokkaido, which is missing in Sanson's map, is attached to the mainland as part of the Yupi peninsula. New Guinea is divided into Terre de Papous and Nouvelle Guin�e. 94 DESNOS, L. C. L'Asie dress�e selon l'�tendue de ses principales parties� Paris, 1772. Limites en col. ancien. Petits accrocs sans gravit� aux pliures, infimes trous de ver. Bel exemplaire. - Minor tears along the folds. Origin. outline colour. Fine copy. 975 x 1018 mm. 95 L'ISLE, G. de. 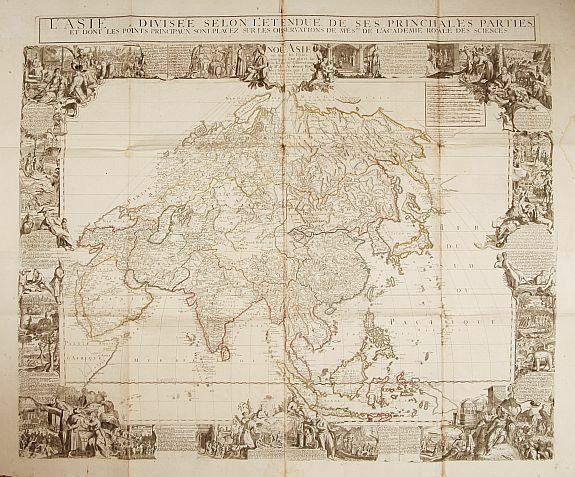 Carte d'Asie dress�e pour l'usage du Roi� Paris, 1788. Limites en col. d'�poque. Rousseurs et nombreuses taches d'encre. 490 x 631 mm. 96 BRUE, A. H. Carte Physique et Politique de l'Asie. Paris, 1826. Limites en col. ancien. Infimes rousseurs. Bel exemplaire. 575 x 860 mm.